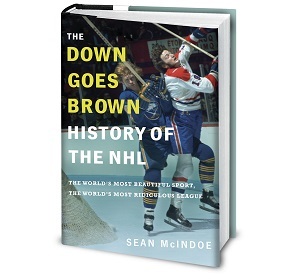 Down Goes Brown: What can the rest of the league learn from the NHL's big four? What can the rest of the league learn from the NHL's big four? Midway through the second round of the playoffs, the NHL has a shot at an interesting conference final scenario. The Kings, Blackhawks, and Penguins are all leading their series, and the Bruins are still very much alive despite trailing the Canadiens, 2-1. If Boston can come back and the other three teams hold on, we’d be left with a repeat of last year’s final four. That would be an especially rare result, not just in the NHL but across North American pro sports. The NHL has only had one repeat final four since the Original Six era (it happened in 1977). And according to the Elias Sports Bureau, it’s only happened once in MLB (1978) and once in the NBA (1952); it’s never happened in the Super Bowl–era NFL. So would a final four repeat just be a fluke? Or is it possible these teams know something the rest of the league doesn’t? That Boston, Chicago, Pittsburgh, and L.A. also happen to be the league’s four most recent Cup winners might make you lean toward the second option. I figured I’d take a deeper look at these four teams, and see what sort of lessons they could offer us about building a successful NHL contender. That turned out to be easier said than done, because while they have plenty in common, finding any one factor that applied to all four gets tricky. Have you ever tried to get four kids to pose for a photo, only to find that one is constantly wandering off? That’s what this felt like. So instead, here are eight lessons we can learn from most of the NHL’s big four, along with the one team from the group that ruins it. They say you build a championship team from the net out. We’ll get to the goaltending part of that equation in a minute, but whoever you’ve got in the crease will need a solid blue line in front of him. And the easiest way to build one is to find one stud to handle the heavy lifting. Chicago’s Duncan Keith is the odds-on favorite to win the Norris this year, thanks to a season that saw him rack up 61 points while logging big ice time. He’s already won the award once, in 2010. Not bad for a guy who slipped to the 54th pick in the 2002 draft, just behind such noted stalwarts as Alexei Kaigorodov and Barry Tallackson. If Keith doesn’t win, this year’s award will probably go to Boston’s Zdeno Chara, another previous winner who’s a finalist for the sixth time. In addition to being absolutely terrifying, Chara is probably the most successful free-agent signing of the cap era. It seems strange now, but there were doubts about Chara’s overall game when the Bruins pried him out of Ottawa with a $37.5 million offer in 2006. Eight years later, not so much. The Kings’ Drew Doughty didn’t earn a spot in this year’s top three Norris vote-getters, though there’s a good chance he finishes fourth. He’s the youngest of the trio at 24, which means we probably haven’t seen his best yet. That’s a scary thought for a guy who was already a Norris finalist in 2010 at the age of 20. Having one of the league’s best defensemen on your roster doesn’t guarantee you a deep playoff run — hello, Shea Weber — but it sure helps. The exception: Is Kris Letang a stud? He’s certainly paid like one, and he was a Norris finalist just last season. But despite his inspiring comeback this year, he’s not really viewed as being in that Chara/Keith/Doughty ballpark. I would never have bought fifa 14 coins anything just because it was practical, would not show soil cheap fifa 14 coinsor was guaranteed to last a life time.